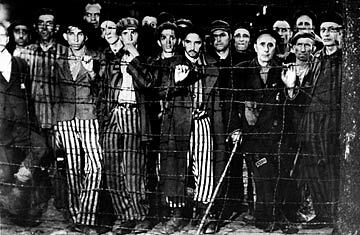 Holocaust survivors stand behind a barbed wire fence at the Buchenwald concentration camp shortly after being liberated by American forces. On Dec. 8, a task force led by former U.S. Secretary of State Madeleine Albright recommended that President-elect Barack Obama create a dedicated interagency group that would respond to genocide by analyzing emerging threats and coordinating action with other nations. The panel, which also includes former U.S. Central Command chief Anthony Zinni, former Senate majority leader Tom Daschle and former Secretary of Defense William Cohen, recommended that the U.S. government invest $250 million in new funds for prevention and response. Meanwhile, as the crisis in Darfur heads into its sixth year, with an estimated 5,000 displaced people dying each month, the 60-year-old Convention remains an unrealized promise. Beyond the legal hurdles, there are grave political repercussions to responding to an ongoing atrocity. Some say accusations could prompt deeper isolation and violent reprisals, making conditions worse for the victims and those trying to help them. See pictures of Adolf Hitler's rise to power.